I feel like kicking myself. There is not even one recent photograph of mine with my daughter in love and son. I must remedy it asap and arrange for it to be framed and saved for posterity. In the meanwhile, this selfie taken last year must suffice for this post. 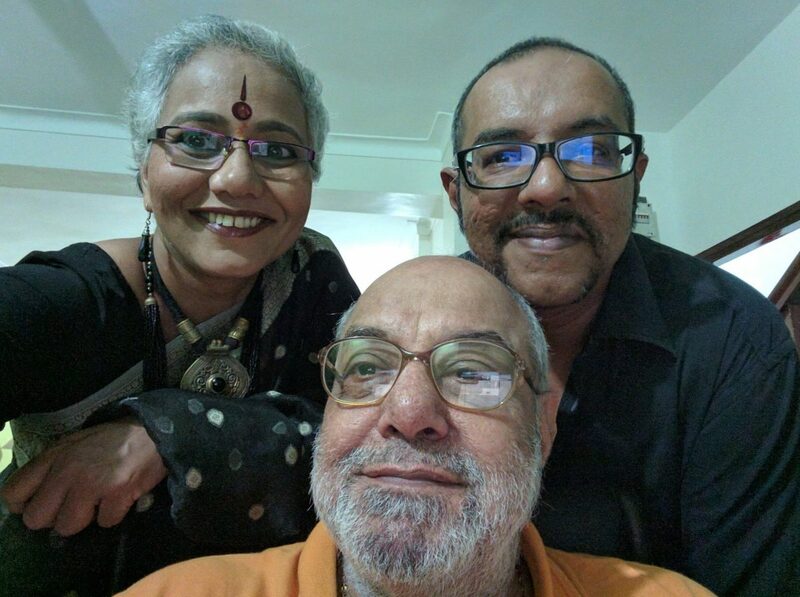 Five years ago today, Manjiree and Ranjan got married to each other and Manjiree moved into our home. I wrote about it in my blog Manjiree. Today, there was a minor celebration in the afternoon with some sweets and savouries for me and Ranjan as Manjiree is away staying at her sister’s home which is closer to an institution where she is undergoing training to be capable of being in charge of an animal shelter. Ranjan will be joining her and other young people to celebrate their wedding anniversary while I will puppy sit at home. When Manjiree came into our home, it had been a bachelor’s pad for four years and one run by me while also being a care giver for my late wife for another seven years before that. It really had not had a woman’s touch since 2001 and it showed. Manjiree brought in the much needed feminine touch and today she truly is the Lady Of The House. She has got the kitchen and living areas redone and the garden completely relaid and looking absolutely stunning. She has also brought in Chutki the second lady of the house and most important, Mangal and Yakob are completely lost without her. I am a contented old geezer being thoroughly spoilt by these two ladies and the bemused and benign Man Of The House, Ranjan. I use this post to convey my gratitude, blessings and best wishes for many more anniversaries to Manjiree and Ranjan. This entry was posted in Family and tagged Wedding anniversary. Bookmark the permalink. 17 Responses to The Lady Of The House. It is not a goal my friend. It is now fait accompli! I’m happy for you all — congratulations! Was it really five years ago?! It seems like yesterday — isn’t that what we old folks always say? Exactly. I almost said that and did not because it would have sounded so blase! I’m using Safari instead of Firefox and your post displays correctly here. I will fill in my contact information, then try again to see if it gets saved for my next comment. No, I have to fill in the information again. Okay. My earlier comment remains unchanged. Okay. I use Chrome all the time and don’t mind filling in the details every time instead of changing browsers. Thank you. Time has indeed run fast. I love that picture! it’s a good one of all of you. I too have noticed time moving faster. but you three seem to be in a holding pattern as to aging! you’re lookin’ very good there Sean! Thank you Tammy. I plead not guilty. I have nothing to do with my non changing appearance. It simply is! This is a heart warming post and I am so glad for all of you being such a happy, supportive and harmonious family. My best wishes of many happy anniversary returns. Thank you Anna. At least as far as I am concerned, supportive is an understatement. The two youngsters not only support me but, also spoil me silly. Happy Anniversary to the beautiful couple. May they celebrate this special occasion for many years to come :D.
Now, I must say one thing here: you know I am not a feminist but I must praise the female ability to turn a home into a beautiful and harmonic place. We women have that ability and unfortunately you boys do not; however, I admit men have a ton other abilities we do not have and that is why we complement each other so very well. Here’s to the Creator for having formed such beautiful elements: a man and a woman. Max, thank you. Just to make you happier than you usually are, I shall send you an email.